So you need a roofer that can supply you with residential or commercial roofing in St Martinville, LA? For dependable roofing, you can call on ECO Commercial Roofing at (833) 200-0571 to save the day! Our professional roofing contractors are skilled at delivering excellent roof services, but we’re specialists in customer service. Not only are we dependable St Martinville roofers, we’re also participating members of our local communities. Our contractors are very knowledgeable on the many kinds of roofing, and we are happy to assist you with any of your roofing questions or concerns. Choosing a dependable roofing contractor is always easy when you rely on ECO Commercial Roofing! A reliable contractor is critical when it comes to any service on your house or business. To provide clients with that peace of mind, we use top quality products from Conklin, and we educate each of our roofers to the industry standards. Because the type of roofing you install can affect the value of your building for years to come, we are sure to carry large selections of materials and styles for you to choose from. Everyone enjoys a particularly stylish roof, but be sure to look at all of the long term benefits involved, too. Your budget will also be a deciding factor, along with to the kind of building the roof will be installed on. We have plenty of quality options to pick from. We provide dependable roof repairs, roof replacements, and roofing installations too. Whether you need assistance with a business project, an industrial one, or a residential one, we can assist you! When you own a business building with a typical style roof, our commercial offerings may be the services properly suited for your requirements. If you need your flat roof to endure without any additional problems like leaking and ponding, specialized installation will be necessary. Industrial roofing is similar to commercial roofing, but such roofs need particular installation, as well as specific material requirements if you want them to last long. You can even count on us for affordable home roof services, designed to serve your home in a variety of styles. Roof restorations are our primary specialty, meaning we are no strangers to roof coatings. In our expertise, using top quality materials like Conklin can really make the difference between a roof coating that lasts, and one that doesn’t. If you need better roofing in St Martinville, LA, you can depend on us to provide you with unmatched craftsmanship, and high quality services. Call our professionals at (833) 200-0571 if you’d like to learn more about our roofing restorations, and the benefits of Conklin roof coatings! As experts, we typically recommend roof restoration to our customers as a technique for repairing your roof and protecting it from additional damages. Properly done, one of our Conklin roofing restorations can add an additional 10 years to the life of your roofing! Picking a roof restoration from a quality roofer will conserve your time and money in comparison to a complete roof replacement. 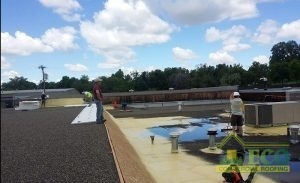 Commercial Roofing Did you know that you can avoid early roof replacement by choosing a commercial restoration? Our roofers typically perform our roof restoration with reliable roof coatings from Conklin. It can be hard to decide which roof coating is ideal for your needs, when presented with the expansive variety of options, but our expert roofers are here to assist you! Various coatings deliver varying levels of adhesion, flexibility, and water resistance. 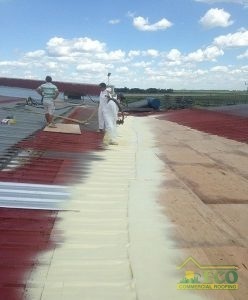 Generally, we can also apply the roof coating without removing the previous roof material. Contact us at (833) 200-0571 today to request an inspection! Among the many types of commercial roofs we can provide, are low slope roofs along with flat roofs. Proper installation is key if you want to avoid issues such as leaking, ponding, or premature failure. When we create a flat roofing system for a client, we build that solution to protect and serve their structure for decades. ECO Commercial Roofing is the company you can count on when you require resilient commercial or residential roofing services. We not only provide our expert roofing in St Martinville, LA, but additionally in the surrounding areas. Investing in a reliable roof for your building will undoubtedly benefit you later on in that business. To discover how we can help you best, give us a call at (833) 200-0571 and set up your expert roofing assessment now!